Sim Champs its time to cover all the latest healthcare simulation news from around the world again! From new simulation center launches, to program investments, new simulators, collaborative training experiences, market trends and more — HealthySim has you covered with a recap of the best medical simulation news highlights from around the world. Isn’t it exciting how much our community is growing? Share your success story through the link at the bottom! 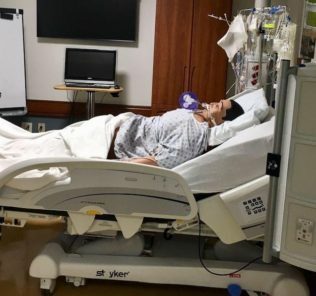 University of Kentucky Opens New Sim Center – UK HealthCare has opened the doors to a new, state-of-the-art simulation facility. The approximately 7,000 square feet space, located on the second floor of University of Kentucky Chandler Hospital, will house technology needed for multidisciplinary training and research to advance patient safety and educate today’s students and tomorrow’s health care providers. The Simulation Center is led by Dr. Zaki Hassan, a professor of anesthesiology and surgery. 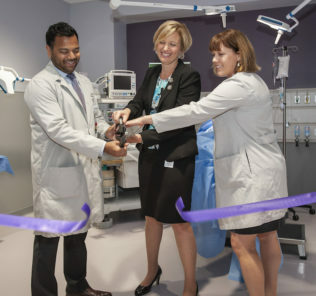 “Our new simulation center will provide all healthcare professionals at the University of Kentucky the ability to undertake guided immersive training, practice and learning with the use of high fidelity and task simulators,” said Hassan. “Our health care personnel can learn technical skills, crises resource management and recreate and amplify real life clinical situations without compromising patient safety.” Photo Credit: Olivia Ramirez of University of Kentucky. 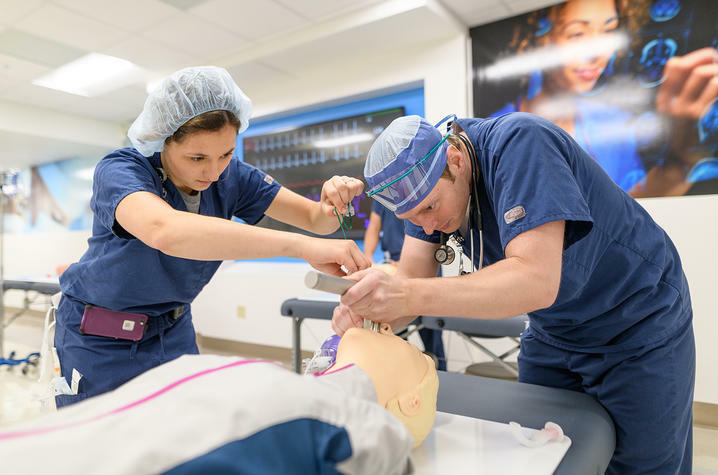 Columbia University School of Nursing Starts Use of New Pediatric Simulator HAL – Columbia University School of Nursing has launched a new innovation in its clinical simulation curriculum using “Pediatric HAL,” the most advanced pediatric patient simulator. The first of its kind to simulate life-like emotions, responsive facial expressions, speech, and movement, this new robotic technology is being used as part of the school’s curriculum to help nursing students develop the specialized skills needed to effectively communicate, diagnose, and treat young patients in all clinical settings. 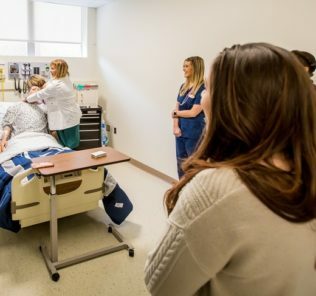 Columbia Nursing is among the first schools in the United States to use the simulator and the first nursing school to use it in New York State. Wireless and tetherless, the simulator’s robotic technology is capable of nearly a dozen facial and verbal expressions that demonstrate anxiety, anger, amazement, and crying, as well as responses to pain. It also possesses dynamic lung compliance, which emulates real lung functionality, aiding the school’s Certified Registered Nurse Anesthetist students to practice intubation and delivering anesthesia. Because of his anatomical and physiological design, he is able to simulate medical crises, such as lung collapse, helping students learn to perform emergency interventions, such as chest tube insertion. PennDemic 2018 Simulation Training Event Combats Epidemics – Seventy hopeful healthcare professionals crowded into Penn’s Claire Fagin Hall to combat an outbreak of the plague on Saturday. The outbreak, which had started in Washington D.C., threatened to stretch to Philadelphia. The scenario was a simulation entitled PennDemic 2018: An Interprofessional Infectious Disease Outbreak Simulation for Penn Students. It sought to impress upon the graduate student attendees the importance of interdisciplinary work in containing a large-scale medical crisis. The eight-hour event was the first of its kind on Penn’s campus and took more than a year of planning on the part of members of the University’s extended healthcare community. Event organizers selected the participants after a short application process. Local News Covers Labor Simulation Program at Aurora BayCare Medical Center – Continuous training is important in the healthcare profession. Aurora BayCare Medical Center is using life-like simulators that mimic real-life patient reactions to help save lives- providing realistic hands on training. Dr. Stephen Sehring is the Medical Director of Women’s Health Services he says working on simulators is better for training than working on mannequins or actors, “We can increase her blood pressure, decrease her blood pressure, we can do things with her that a an actor wouldn’t be able to replicate,” said Dr. Sehring. NKU to unveil $105M Health Innovation & Simulation Center – The state-of-the-art technology and learning centers–including the St. Elizabeth Healthcare Simulation Center–make the HIC one of the largest and most comprehensive health professions buildings in the country. “The Health Innovation Center transforms how we educate and train the next generation of health care professionals with an interdisciplinary approach to addressing our population health challenges. I see it as the nexus of talent, innovation and community development,” said President Vaidya. “A project of this scope doesn’t happen with one institution. It takes everyone making a commitment to improve education and health outcomes in the region. We are incredibly grateful for the commitment from our state legislature, St. Elizabeth Healthcare, local leaders and other community partners.” The $105 million project is home to NKU’s College of Health Professions and the Institute for Health Innovation. The Kentucky General Assembly allocated $97 million toward the construction of the HIC. Vascular Surgery Association Collaborates with 3D Systems to Provide New Skill Assessment Exam For Vascular Surgery Trainees – The Association of Program Directors in Vascular Surgery (APDVS) is pleased to announce Fundamentals of Endovascular Surgery (FEVS) – a new simulation-based vascular surgery skills training and assessment exam developed through its collaboration with 3D Systems. This program is part of a broader curriculum, The Fundamentals of Vascular and Endovascular Surgery (FVEVS), which also includes an open surgical component, The Fundamentals of Vascular Surgery (FVS). The goal of FEVS is to enhance endovascular core skills, objectively assess the skills of vascular surgery trainees, and ultimately improve the ability to qualitatively assess trainees. APDVS anticipates that FEVS will become a requirement for vascular surgery certification. Inside the Texas Tech: Poverty Simulation – Geist has done poverty simulations since 2014, doing as many as six a year. A week before this simulation, she did one for school nurses in the Lubbock district. The program she uses, and where she was trained as a facilitator, was created by the Missouri Association for Community Action. The simulation, Geist says, helps policy makers, local community leaders, students and organizations. Those in healthcare benefit as well. “A lot of the students had told me that they understand now what it is that they need to do when their patients are being discharged to make sure that they follow up and say, ‘ok are you going to be able to go to the grocery store and get this, this and this? Are you going to be able to go to the pharmacy and get these prescriptions? Can ya’ll afford them?’ That kind of thing,” Geist says. Before the simulation started, participants were uncertain how the program would be done. That sense of uncertainty, Geist says, is part of what those in poverty often feel. Research Alert: Cultural Humility in Simulation-Based Education – Healthcare disparities have been documented in the research literature for decades. Recently several EMS studies revealed disparities in the provision of care in the field based on patients’ race and gender. These results mirror those found across other healthcare settings and compel further research to better understand and eliminate such inequities. One direction is to integrate the principles of cultural humility into competency evaluations during healthcare professionals’ initial training. A growing body of research on the science of simulation supports its expansion as a means of teaching and assessment in healthcare education programs. But how often has the literature cited the use of simulation to teach and evaluate principles of cultural competency and cultural humility? Similarly, what are simulation best practices for underrepresented students in healthcare education programs? Researchers from the University of Miami and Johns Hopkins conducted an integrative review of existing literature to examine the state of the science of cultural humility in simulation-based medical education. Unlike a systematic review, which examines quantitative experimental studies, an integrative review includes nonexperimental research and qualitative studies and may include practice analyses, theory, and guidelines. In both types of reviews, the researcher follows a carefully prescribed protocol for literature search, data collection and analysis, and assessment of validity. University of Mobile to reveal new $4.6 million ‘living laboratories’ on Tuesday – UM President Timothy L. Smith, PhD, PhD, said Prac-ademics expands traditional classroom learning into living laboratories where students have practice learning experiences to enrich the learning process. Classrooms and laboratories in the new center mirror the hospital rooms, operating rooms, intensive care units, science and healthcare settings that graduates will step into as they enter the workforce. The 40,000-square-foot renovation encompasses the College of Health Professions and the College of Arts & Sciences – Department of Natural Sciences. Included in the College of Health Professions is the Center for Excellence in Healthcare Practice, School of Nursing, School of Health and Sports Science, and School of Allied Health. Large windows line the central hallways, providing views into classrooms and labs where students in red scrubs attend to high-fidelity human patient simulators that mimic everything from medical emergencies such as a heart attack to labor and delivery. New technology that enhances learning includes augmented reality, where students can view a virtual 3-D model of the circulatory system and walk around the room to see it from different angles. Code Orange Simulation at McGill University – The McGill University Health Centre (MUHC) took part in one of the largest, most complex Code Orange simulations to date on Thursday, with the Montreal Children’s Hospital (MCH), Montreal General Hospital (MGH) and the Royal Victoria Hospital (RVH) among a number of Quebec health institutions going to enormous lengths to test their responses in a major crisis situation. Code Orange Simulation at the MUHCThe Code Orange was activated at 7:35 a.m. by the Coordination régionale des mesures d’urgence, de la sécurité civile et de la liaison avec les salles d’urgence (CRMUSCSU) of the CIUSS du Centre-Sud-de-L’Ile-de-Montreal after a hypothetical driver plowed into a crowd of people before firing randomly on bystanders, who were rushed to hospitals. The response to this mass casualty situation and its strain on the supply of blood products from Hema-Quebec were key points in a scenario that tested many elements for the first time: The Medurge Emergency Department patient information system; the ability to run several massive blood transfusion protocols simultaneously; and the maintenance of normal operations while receiving pediatric patients at adult sites. Medical school hosts region-wide tornado disaster simulation in Fort Smith – Harvey Potts,executive director of simulation and critical skills, said the college hosted a conference with CAE, the supplier of its disaster drill supplies for the Gulf Coast region states. The conference featured multiple learning sessions plus the drill. “They come here to convene so that we can talk simulation, the growth of simulation, how it can be better used in the educational processes, and make sure we’re all on the same page with the vision of simulation in the future of healthcare,” Potts said. The event allowed students and faculty to participate in the drill and learn what would likely take place in a disaster. Potts said this sort of practice is essential for student preparedness development and a quality education. The simulation tested the students’ abilities to determine what needed to happen in the case of a tornado disaster. Most of the ARCOM students played the “walking wounded,” patients with blunt-force trauma, chest trauma and other medical problems that could be faced in the field. Northern Maine Community College plans simulation center ribbon cutting – On Friday, Oct. 12, at 1:30 p.m., Northern Maine Community College will host the official ribbon cutting ceremony for the new allied health simulation center. The simulation center, located on the second story of the Christie Complex on NMCC’s Presque Isle campus, brings students as close to real-world experiences as they can be in a simulated environment. The simulation center consists of three simulation rooms, complete with interactive mannequins, and has a control room dedicated to each room. Instructors record events that occur in each room to debrief the students after each simulation. Angela Buck, RN, MSN, FNP-C, of the Nursing and Allied Health Department, said, “Our goal has been to provide the highest-quality clinical experience for our students; however, due to changes in modern medicine we sometimes face inconsistent learning opportunities in the hospital setting, which have provided challenges in nursing education. Share Your Healthcare Simulation News with Our Global Audience by Submitting a Story Today!